Friday 4th January 2019 - past 1.5 million web site views - Timeline. Congratulations to all those who fished the match. Many thanks to Scarborough Rock Angling Social Club staff & officials for their hospitality. Members meet at Whitby Bandstand 18.30 hrs - registration, group photograph. Anyone else, who cannot make the Bandstand, and has registered their intent to fish the match, can not start fishing until 19.30 hrs. Weigh-in 22.00 - 22.30 hrs in Fleece car park, Church St. I can now confirm that the new EU sea bass regulations were very recently published and are now in force accross the UK. For recreational fishermen, such as youself and your members this means that mandatory catch and release is now applicable until 1st July, following which a 1 fish per day bag limit applies. 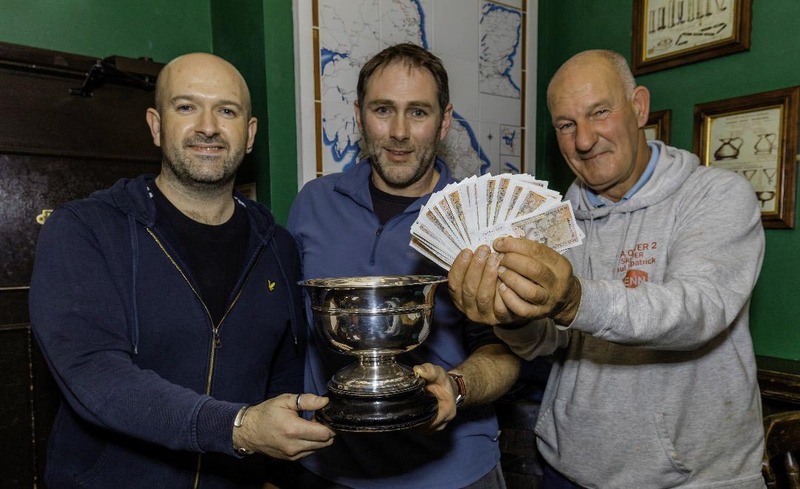 Cloughton win the revival of their inter club match with Whitby sea Anglers Association. 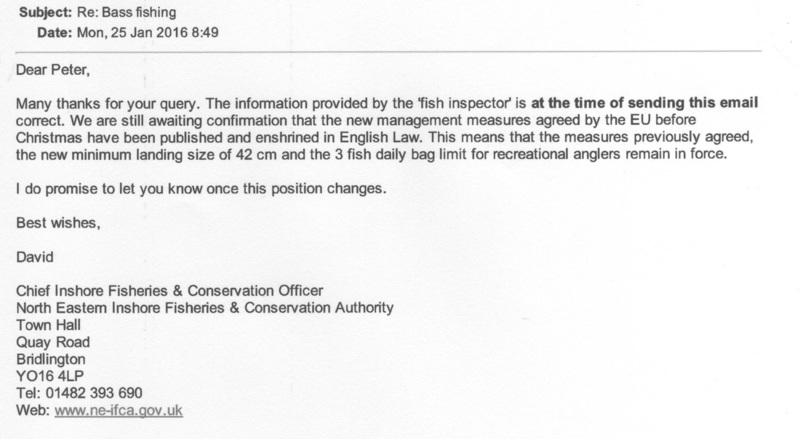 A topic of discussion prior to Bell Trophy registration - Latest Bass restrictions from the EU. 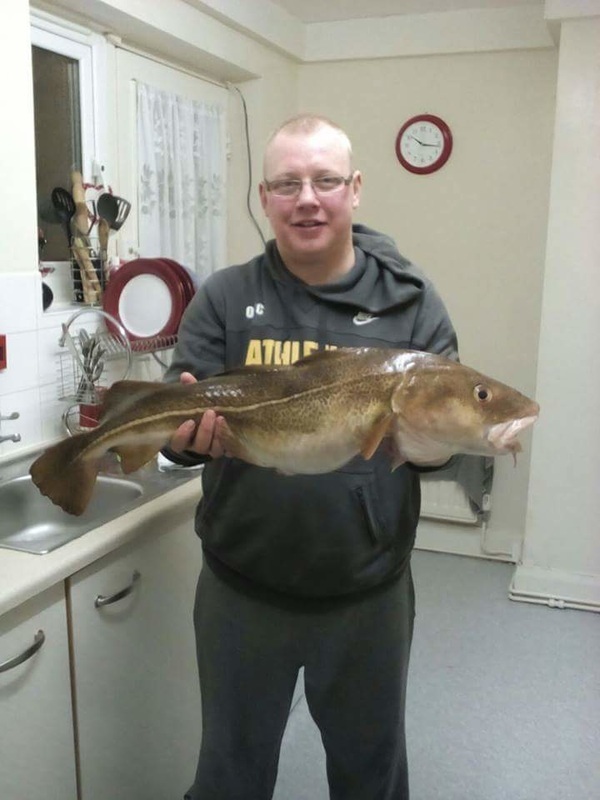 he'd recently had with a Fisheries Inspector - "it's not yet in English law and the 3 bag limit & 42 cms size is still in place for us recreational anglers". 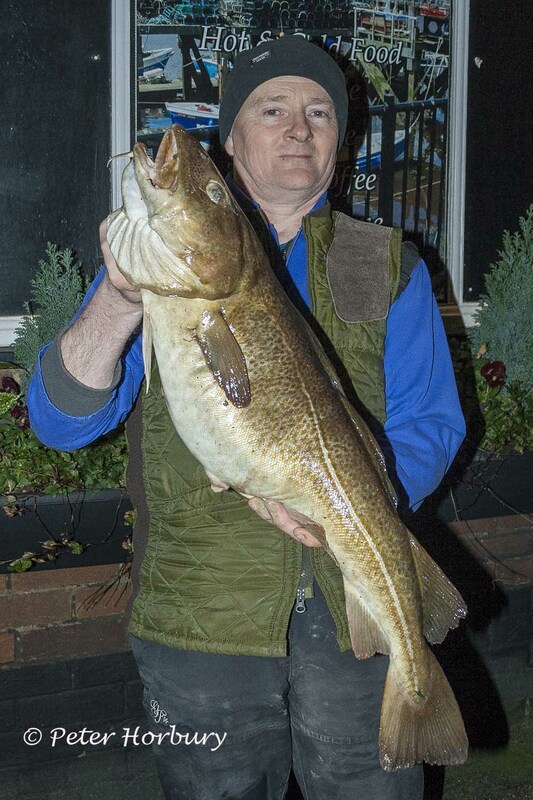 ​Commiserations to Paul Short who broke the WSAA Record Pollock weight of 4 lb 00 oz (held by James 'King Cod' Gilpin since 30th October 2011) only for it to be beaten on the same night by Denis Thompson 9 lb 00 oz - Congratulations Denis. Met up with James Race at Humersea, joining us for a spot of R&R fishing. ​Collected some posters for his Open Match. Tuesday 20th October 2015 - weathermen to start naming storms. 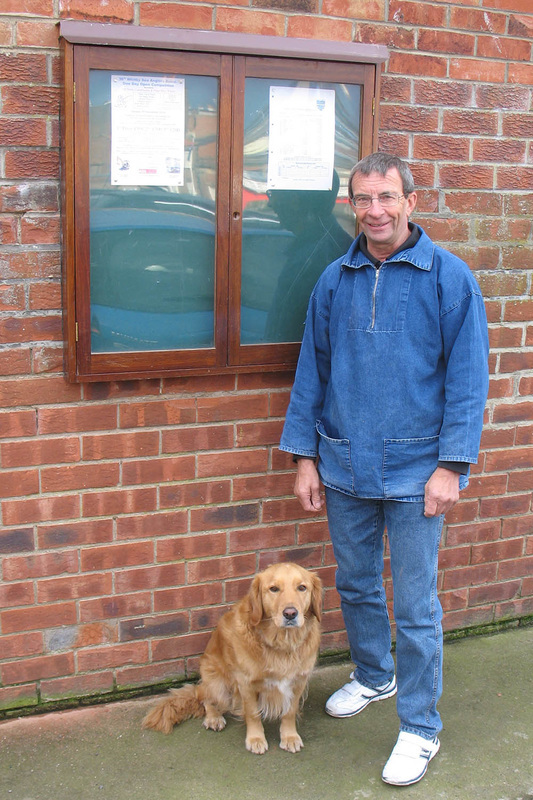 ​Bernard Vasey & I put up the new notice board on the Fleece wall. Bernard Vasey was man of the match. Dave Perrett was in collision with an adult deer. Many thanks from WSAA to Mr Michael Stonehouse for the bequeathment of £1,000 form his late fathers estate. 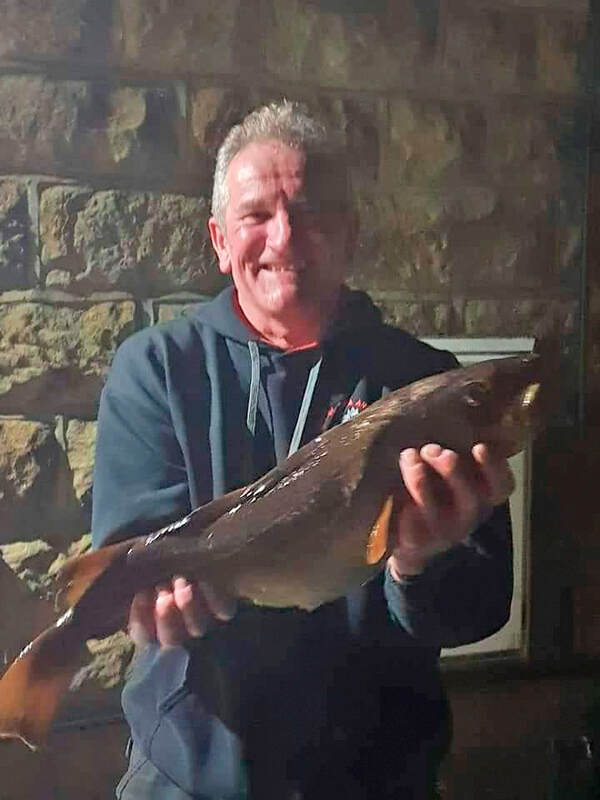 David "Sten" Stonehouse was an old WSAA member and will be remembered by the David "Sten" Stonehouse Memorial Sandsend Trophy for the Heaviest Fish caught out of Competition. £200 is to be spent on a silver plated trophy, and £50 for 16 years will be awarded to the winner, in accordance with instructions received. 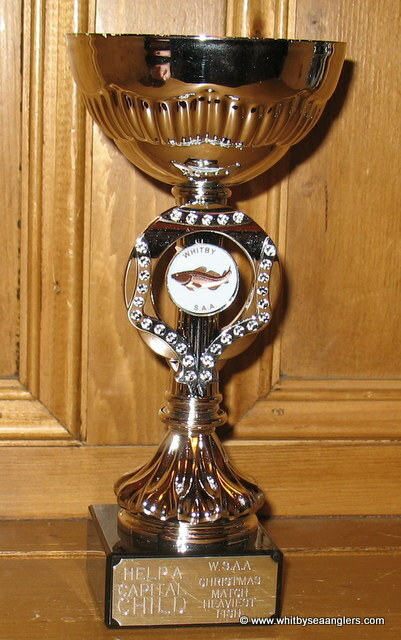 The winner will also receive the Sandsend tankard as a keepsake. Web site past 380,00 views. many thanks for your support. Web site past 340,000 views. Many thanks for your support. Gives a different perspective on the match by match leader board. Shows who excelled in which month. 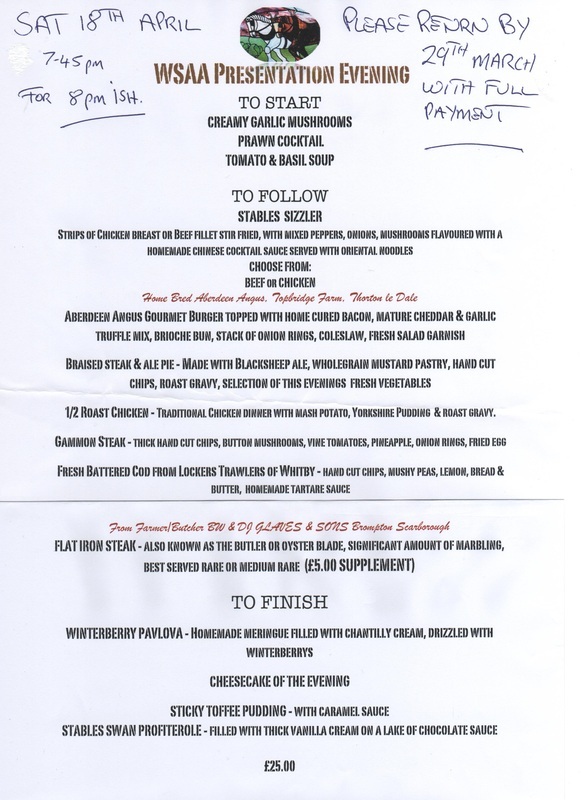 Presentation night menus are available for members to make their selections and return with payment to Dave Perrett by 29th March. Thank you. 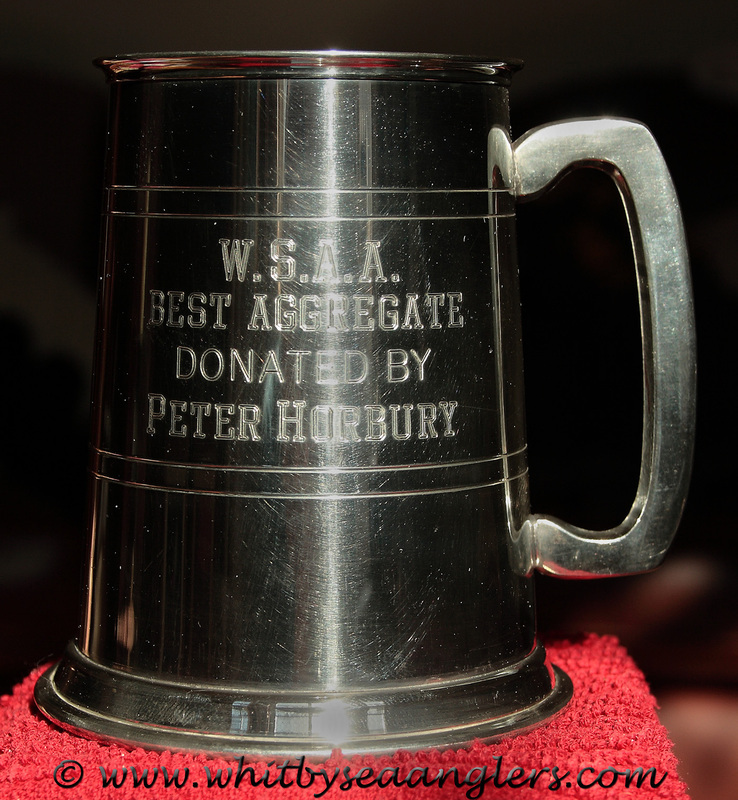 First look at the new WSAA trophy recently engraved by Dave Perrett. Past 310,00 views. Many thanks for your support. 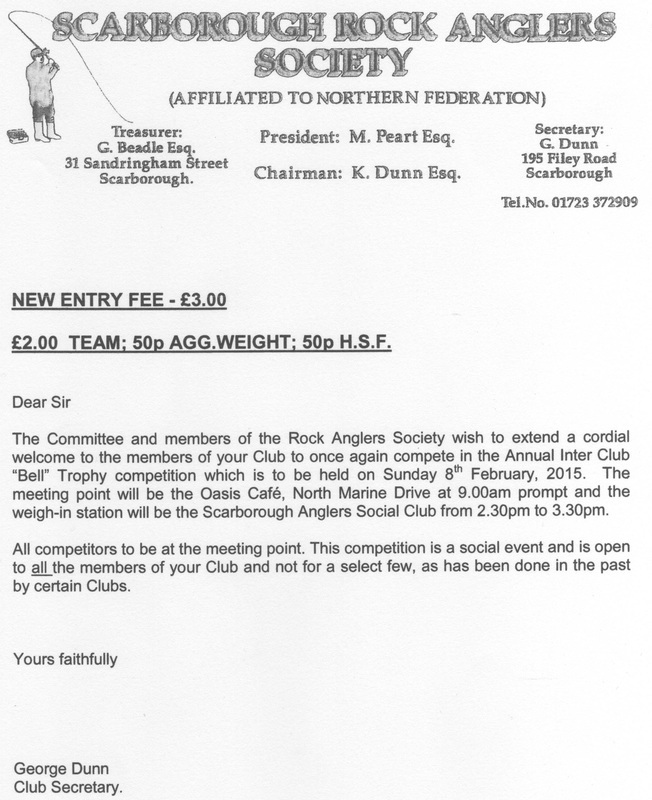 Received invitation from Scarborough Rock Anglers for the Bell Trophy. Best weigh-in of the season 62 fish for 144 lb 10 oz - Five Double Figure Bags. 4 codlings, 6 rocklings and a flat fish for 7 lb 09 oz. 1,509 views yesterday - new record viewing day after 2nd birthday. Web sites 2nd Birthday - 257,875 views - average 353 / day. 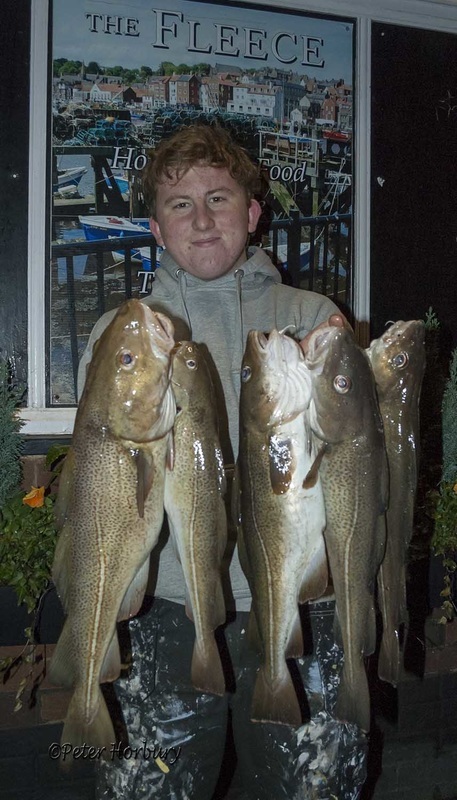 4 codlings for 16 lb 09 oz - Heaviest Fish 7 lb 02 oz. New web site for WSAA past a quarter of a million views last night since launch. 2nd birthday is 16th October 2014. Minutes of AGM held on Wednesday evening 3rd September 2014 published. And more Open sponsors announced. 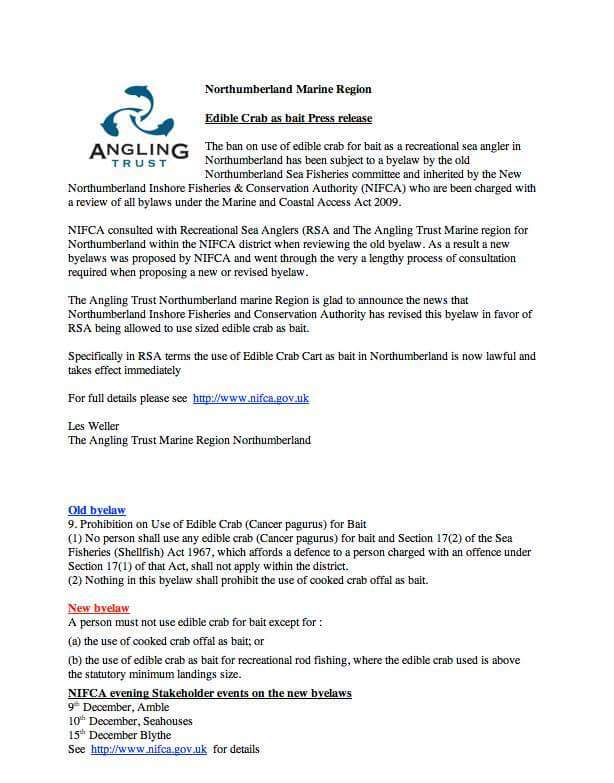 Amended 'Angling Code of Conduct' for Bempton Cliffs posted. 1993 - 1994 Season completed. 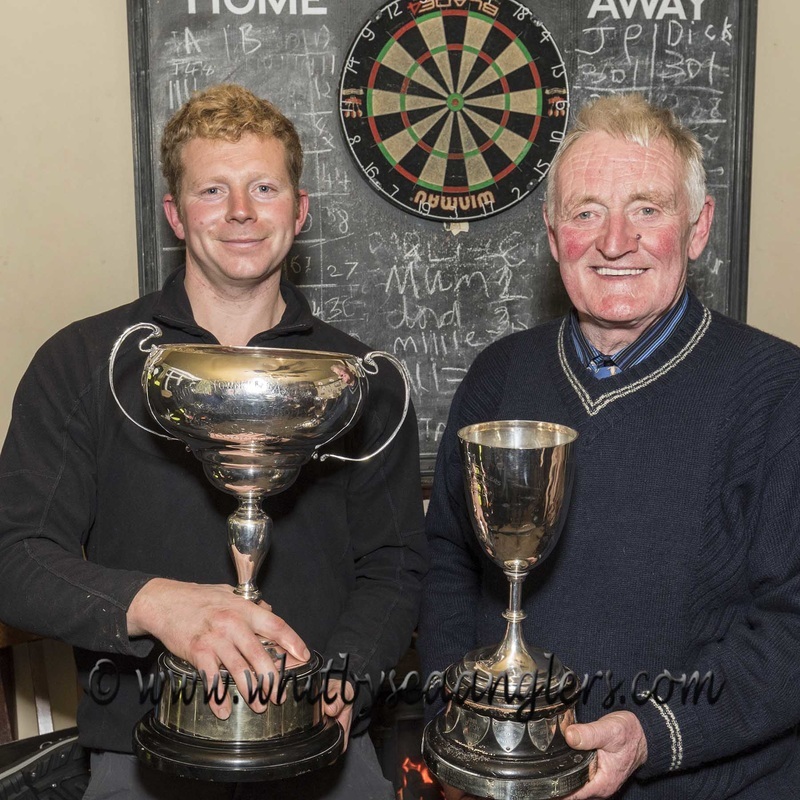 Rob Allison & Dave Hambley have donated two new Trophies "Most Improved Angler" & "Memorable Moment". Members will be given a chance to vote over the next few weeks. After 500 days - 163,289 views - thank you. 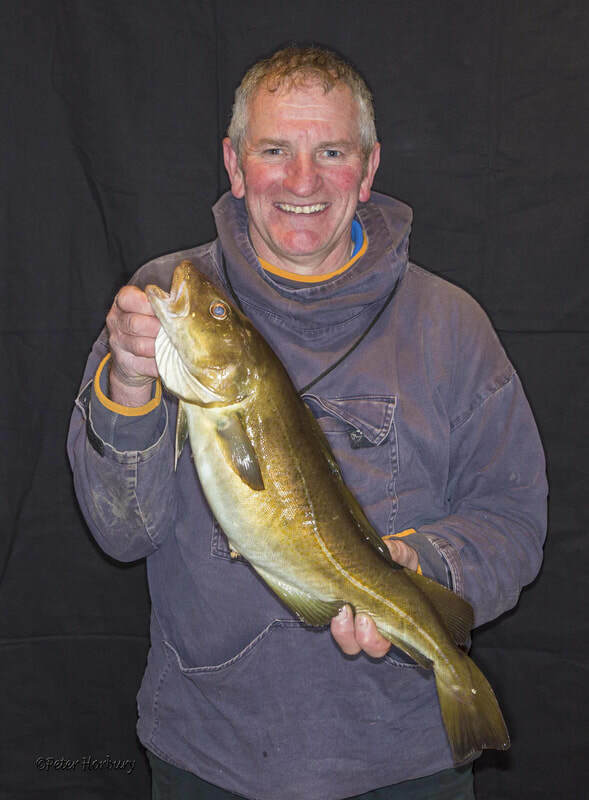 Nearly slipped under the radar but on Wednesday 19th February 2014, Colin Stainthorpe caught two whitings for 2 lb 12 oz, the heaviest of which was 1 lb 12 oz. This is a new WSAA specimen, 43.8% of the British record - well done Colin. 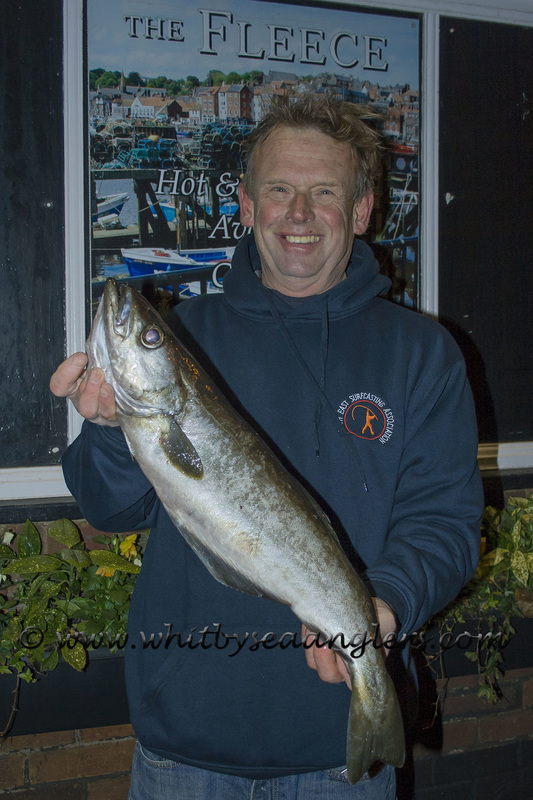 Colin Stainthorpe's 1 lb 12 oz whiting - new WSAA specimen fish. 966 views yesterday as we pass 158,332 views - thank you. Stats. Pasted 150,000 views, thank you as we are averaging 3,000 per week. Matthew Garbutt breaks WSAA record for a seasons accumulative weigh-in and is now writing the record with 16 matches left of the season. Thoughts and prayers with family of missing angler Nigel Savage. 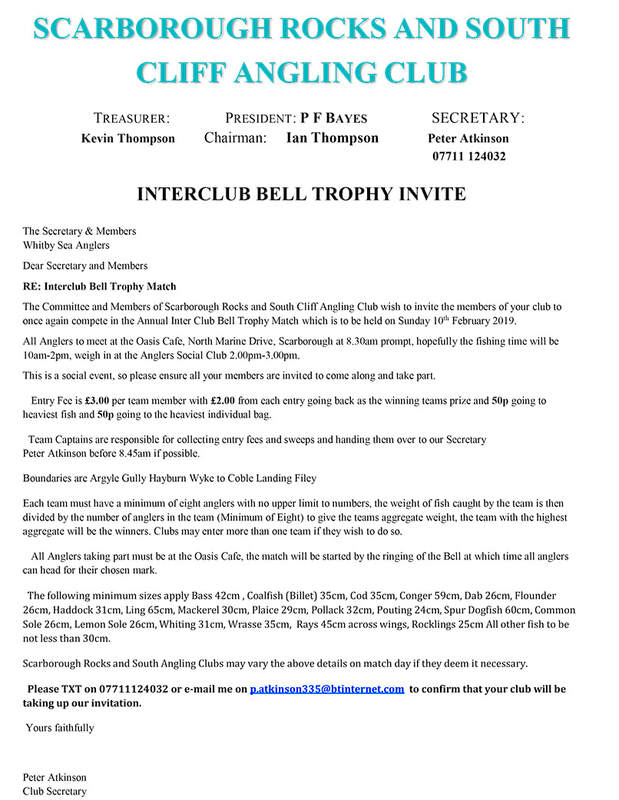 Whitby Sea Anglers Association registered two teams for the Annual Bell Trophy, coming 2nd & 4th - well done to all and thanks to the 20 members who gave up their Sunday to fish. Web site past 140,000 views - thank you as we are averaging over 400 views per day. as tradition has it we follow two weeks later. 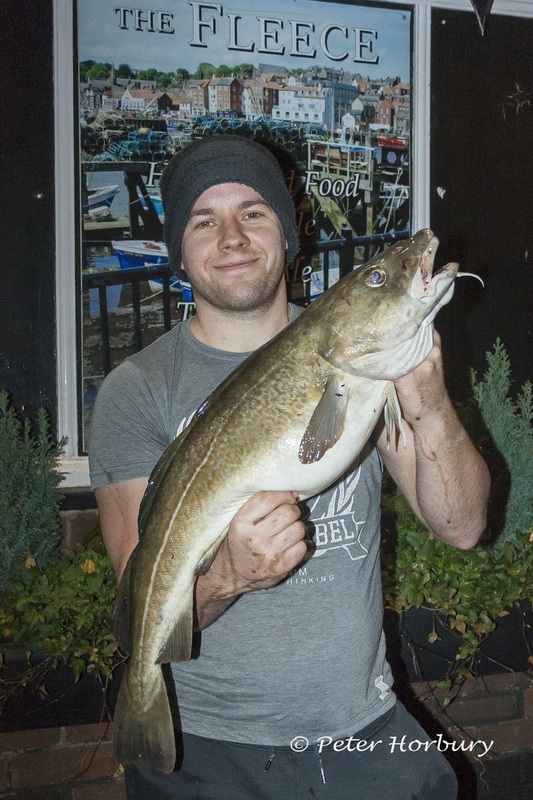 Matthew Garbutt hooks a 12 lb 06 oz specimen cod. Passed 130,000 views - Statistics. New record 1,103 views in 24 hrs as we pass 128,609 since launch 427 days ago - Thank you. 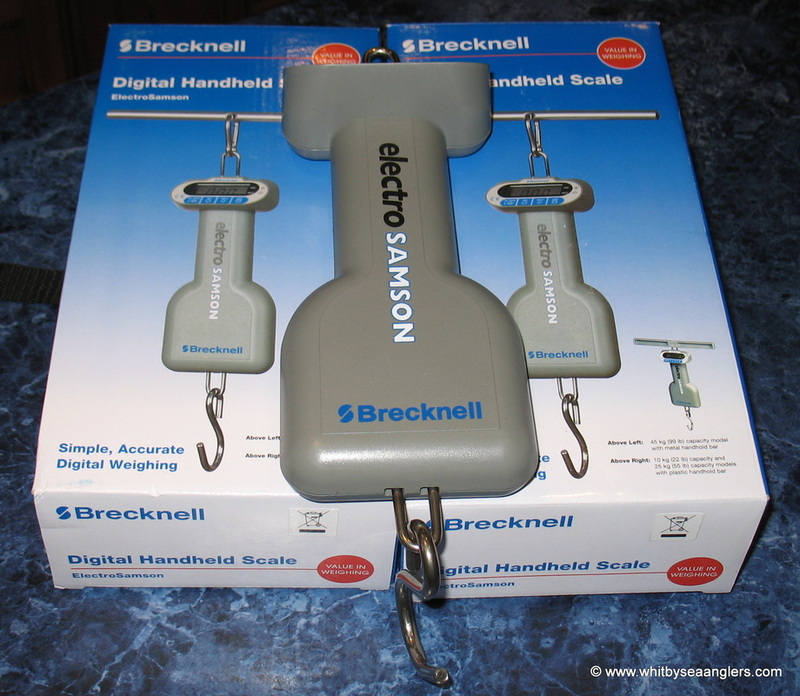 WSAA Treasurer Dave Perrett ordered 2 sets of Brecknell Digital Scales which arrived this morning, to replace those lost in the tidal surge at the Fleece. 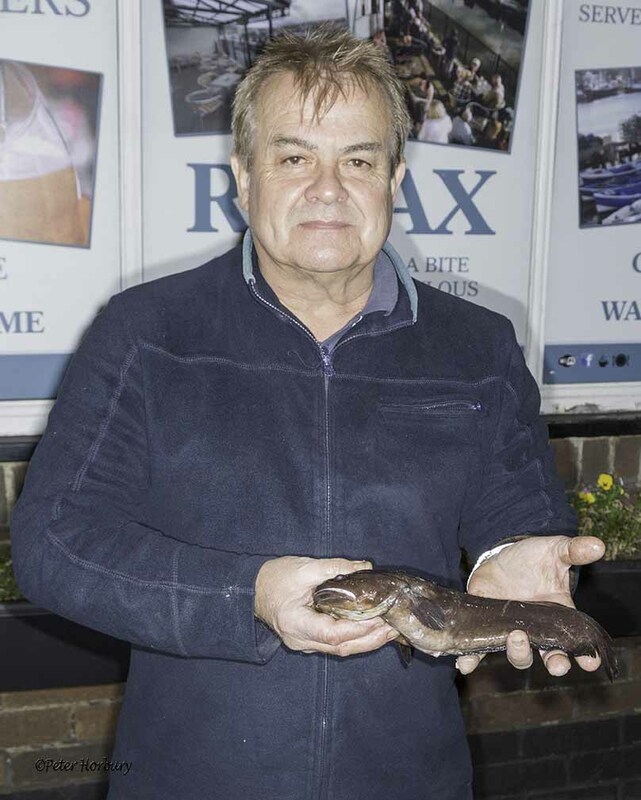 Thank you to Malcolm Pitman, of Whitby Seafishing Supplies, for the loan of his digital scales for WSAA weigh-ins. 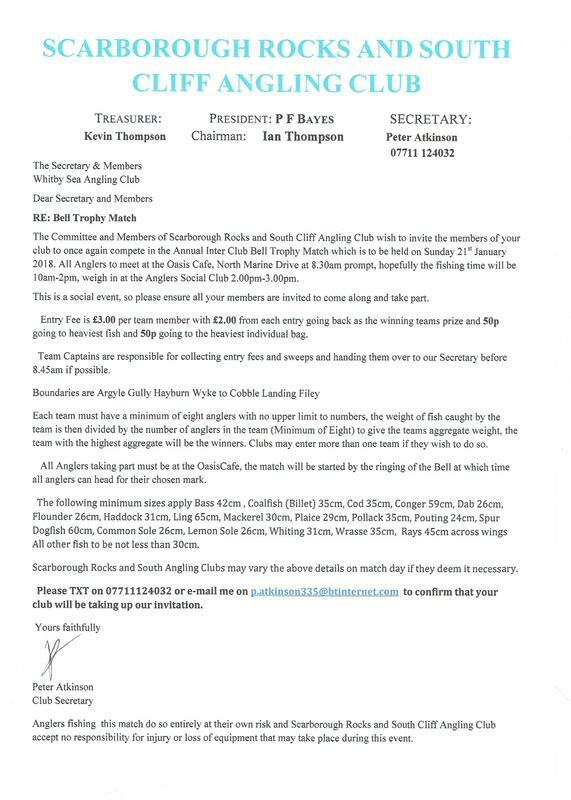 The other set, I have personally bought, so any member wishing to 'weigh-in' an out of competition fish can contact Peter Horbury or weigh-in at any local tackle shop and get a receipt as normal. New record 4,810 views in a week as we pass 125,317 since launch - Thank you. Members will meet at the Wellington, Baxtergate, for the weigh-in & hot refreshments, until the Fleece refit is complete. 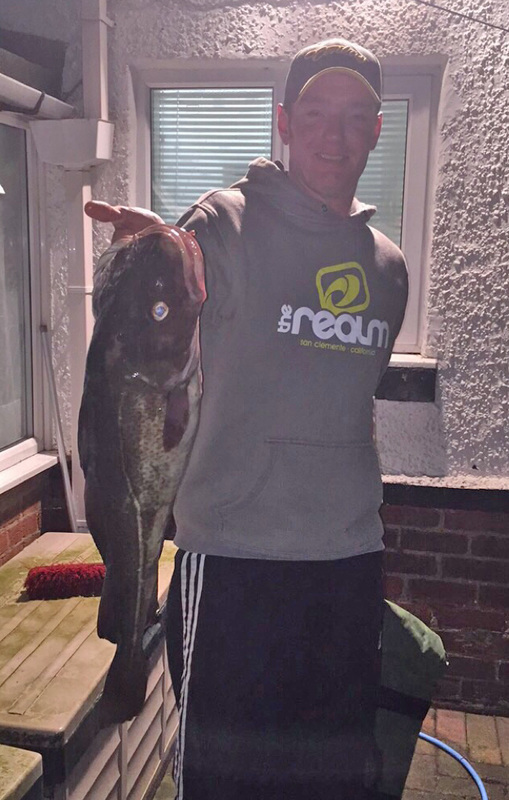 Saturday 7th December 2013 - 22.30 hrs Brian Harland weighs in a couple of good fish - 9 lb 07 oz & 8 lb 04 oz. The first being a contender for Heaviest Fish out of Competition. 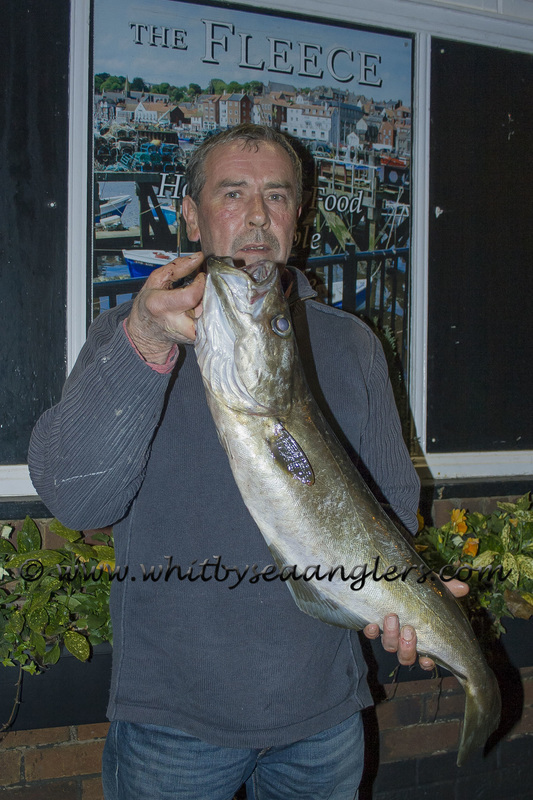 Confirmed by Malcolm Pitman of Whitby Seafishing Supplies - 9 lb 06 oz - lost an ounce overnight. Well done Brian. Landlady of the Fleece, Stormy Coulson rang me this afternoon, sadly due to flood damage the Fleece is closed until further notice, another casualty of the tidal surge in Whitby town centre. The weigh-in on Sunday evening will take place as normal, thereafter members need to decide where to meet until Fleece re-opens. Dave is trying to locate another set of scales, but if anyone has a set please bring to weigh-in. Take note this will also affect the Christmas Match, Sunday 22nd Dec. therefore suggestions from members please. WSAA wish Stormy & John a speedy refurbishment. Thursday afternoon & late Thursday evening - Tidal Surge Damage. 23 members fished, 21 members weighed-in 84 fish for the seasons best 171 lb 04 oz. 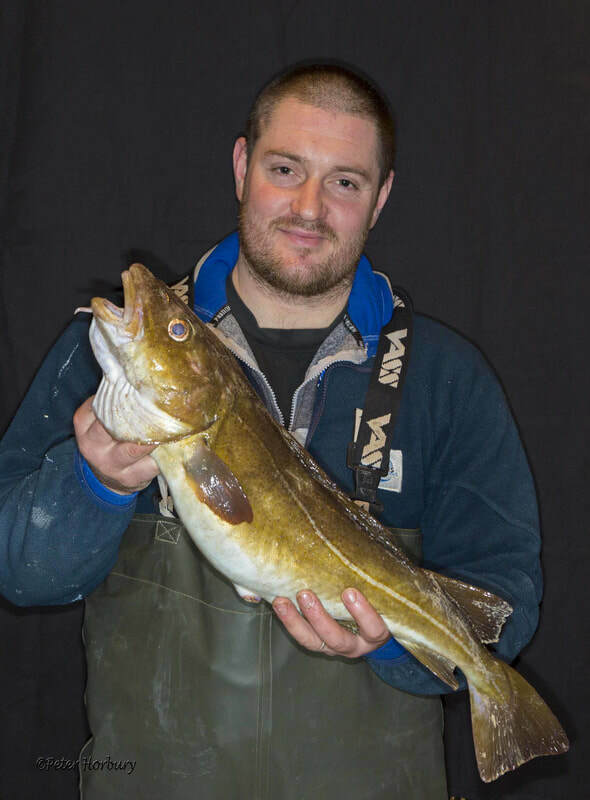 Matthew Garbutt demonstrates another master class in match fishing 10 codlings for 35 lb 02 oz. Received Bell Trophy invite for WSAA to compete in the Annual Inter Club "Bell" Trophy Competition. Monday 18th November 2013 - WSAA Open was a success with 86 seniors and 4 juniors fishing. Thursday 6th November 2013 - web site past 110,415 views - many thanks to all. 1) - Pete Dunn has organised another 'lamp post' match on the evening of 21st November 2013. 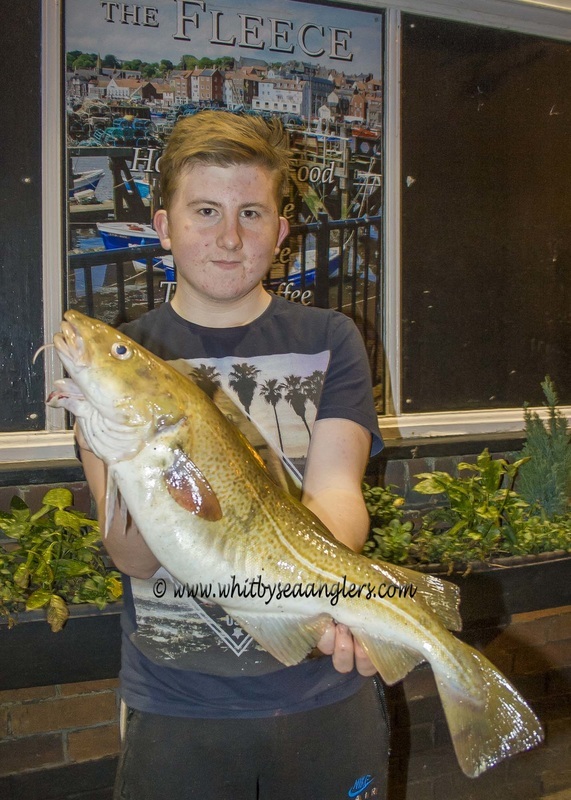 Be at the toll house 6pm to register, fishing will start at 6.30 pm, weigh-in by 10.30 pm at the Scarborough Rock anglers social Club. 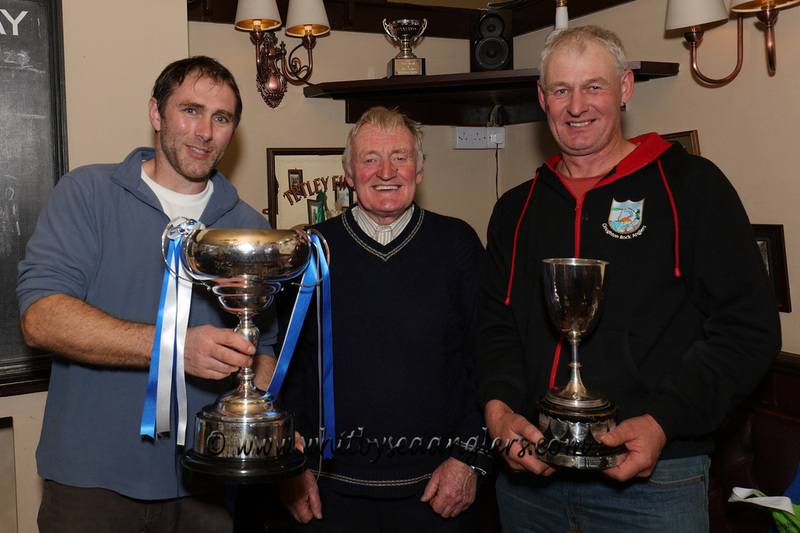 2) - Bell Trophy date has been announced - Sunday 19th January 2014. Thursday 24th October 2013 - web site past 105,000 views. 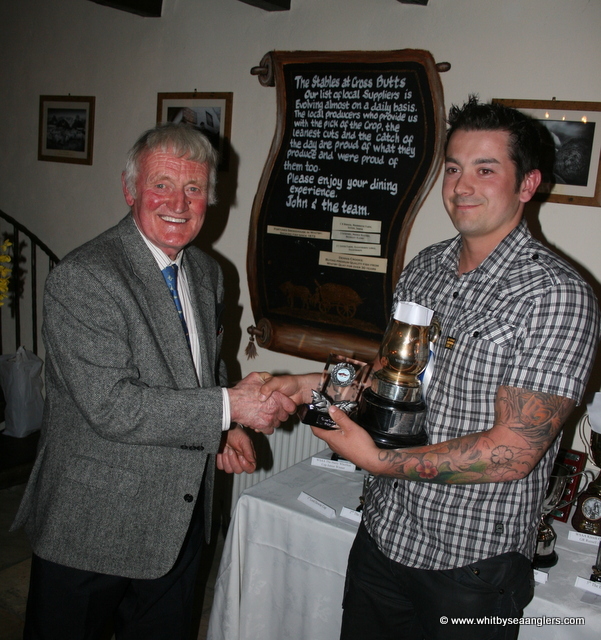 Sunday 20th October 2013 - Rob Allison winner of the 1st Royal Marines Association Charity Open. 16th October 2013 - web site has now been running for 1 year with 102,223 views. Many thanks and tight lines. Tuesday 15th October 2013 - Whitby Rifle Club - 7pm WSAA Open Match meeting. Web site past 100,00 views this morning, many thanks for your support of Whitby Sea Anglers Association. Web site past 96,180 views this morning, many thanks. First match tonight, easterly swell and strong south easterly winds forecast. WSAA start their 2013 - 2014 shore fishing campaign on Wed. night 2nd October 2013. WSAA welcomes new members and Juniors (accompanied by parent or guardian). Everyone meets at Whitby Bandstand (bottom of Khyber Pass) at 18.30 hrs for 1st match. Members who cannot make the Bandstand and are fishing the evenings match cannot start fishing until 19.30 hrs. Members are asked and reminded to put their subscriptions £30 into a named envelope (made up of £15 subs + £3 insurance + £2 end of season sweep, plus 4 match entries £8 and £2 for Heaviest Fish and Heaviest Bag of Fish monthly sweep for October) to be handed to the Treasurer 'after' the match. Members wishing to enter the Singles and Doubles knockout competitions can submit their names after the weigh in 2200 - 2230 hrs, at the Fleece on Church Street, Whitby. 11th September 2013 - just past 91,000 views - many thanks to all for supporting Whibty Sea Anglers Association. First match of the 2013 - 2014 Season is Wednesday 2nd October 2013 due to the late start of the Scarborough Festival. The 2013 - 2014 season will therefore total only 49 matches. Minutes of AGM 28th August 2013, posted 1645 hrs. at 7.00pm for a 7.30pm start. 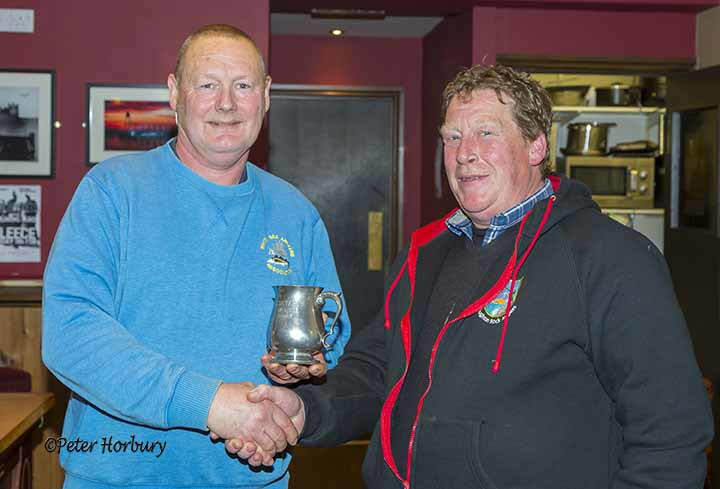 Saturday 20th March 2013 Whitby Sea Anglers Association Presentation night at the Stables, Whitby. Wednesday 20th March 2013 - 701 web site views yesterday, takes total to 50,642 views since launch 154 days ago. Many thanks for your support of WSAA. http://www.ukmpas.org/faq.html for Terms and definitions of No Take Zone (NTZ), Marine Protected Area (MPA), Marine Conservation Zone (MCZ) and others. Wednesday 20th February 2013. New web site record daily viewing 1,027. Thank you for supporting Whitby Sea Anglers Association. Total views in 127 days since launch of our new site is 36,085. Friday 07-02-2013 past 30,000 web site views. 29-01-2013 Malcolm and Paula Pitman, WSAA members, will be opening a second fishing tackle shop at 12, Haggersgate, Whitby around Easter weekend. 27-01-2013 - Filey have announced the following Open dates at the Bell Trophy. Registered for Penn points with Alan Yates at Sea Angler magazine. 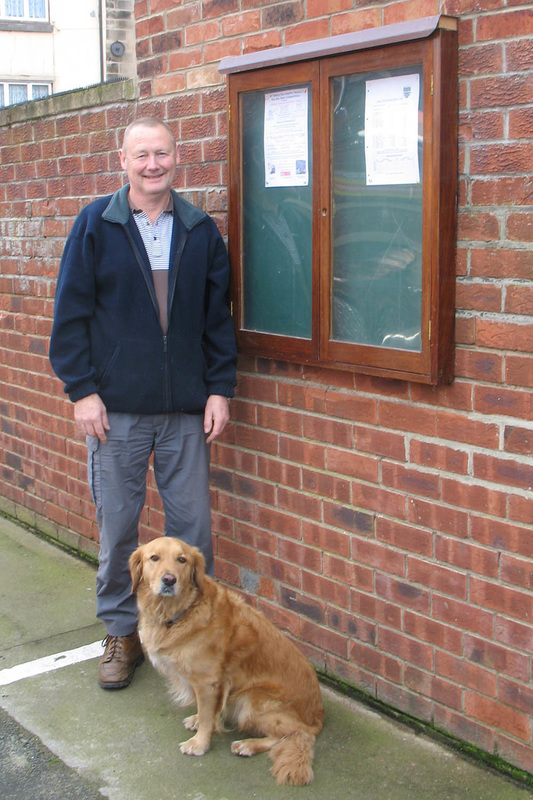 23-01-2013 - Was the 100th day since Whitby Sea Anglers Association launched the new web site. I am please to say that the count for 100 days was 26,244 views. 20-01-2013 - Matthew Garbutt extends his lead over 2nd place Neil Inglis to 102 lb. 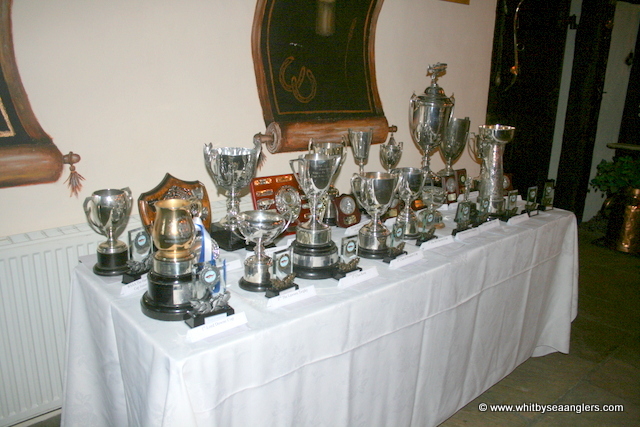 21-12-2012 - Received results and photographs from Redcar Navy & Gentleman's Club - winner WSAA member Mick Beedle. 21-12-2012 - 1520 hrs 15,010 web site views on this our 66th day for the new home of Whitby Sea Anglers Association. Yesterday we had a new record of 715 views alone. Many thanks. Merry Christmas and a Happy and Prosperous New Year to you all. 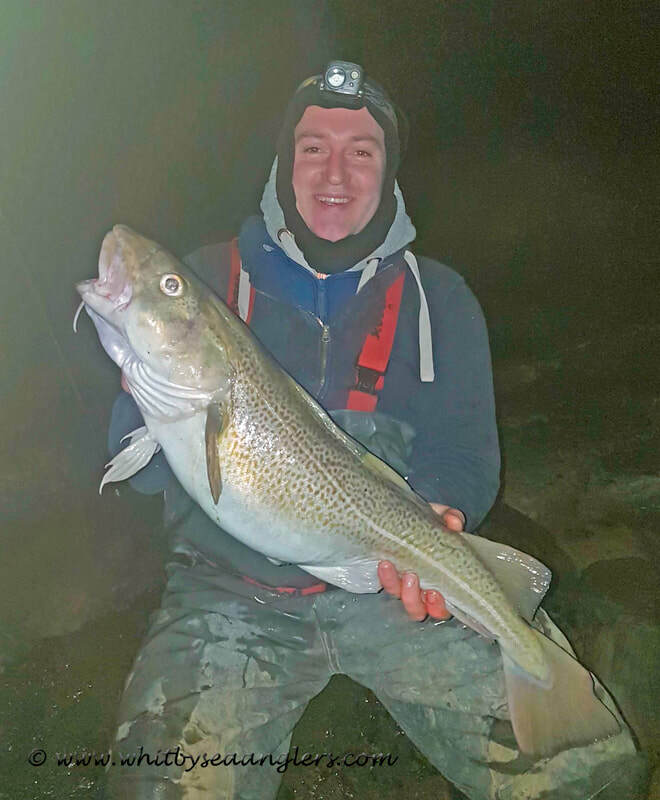 20-12-2012 - Congratulations to 'King Cod', nee James Gilpin on his PB, a cod of 11 lb 08 oz, caught in last nights wednesday WSAA match (19th Dec. 25 of 52). See 2012 - 2013 Results and Standings. 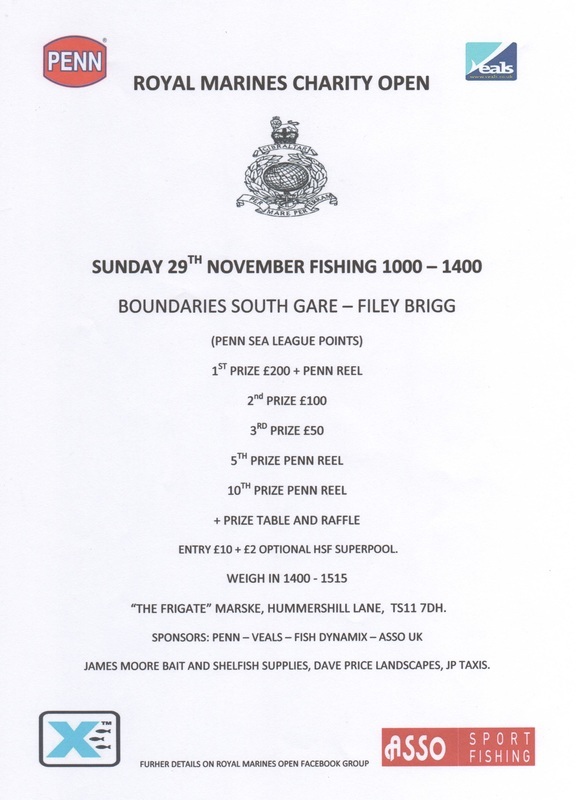 16-12-2012 - Congratulations to Mick Beedle (WSAA member), who with a fine cod of 10 lb 08 oz won Redcar, Navy and Gentleman's Club Open Match. Mick's first double and first Open win, wishing him many more. 15-12-2012 - Congratulations from all at WSAA to Paula & Malcolm Pitman, who got married this week. 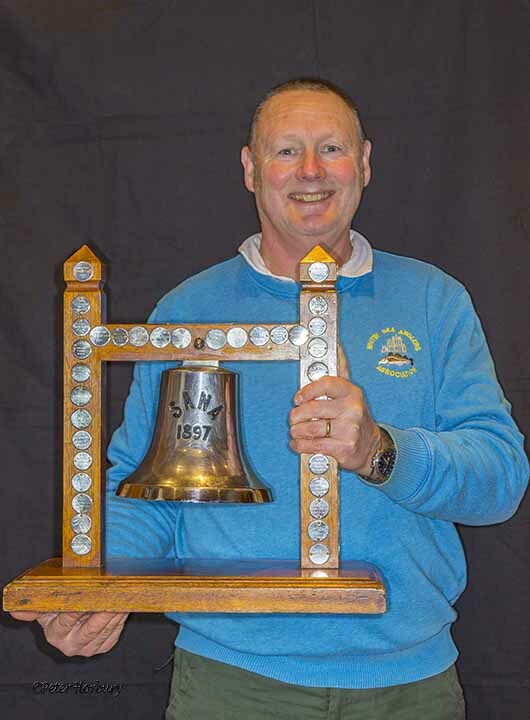 14-12-2012 - Bell Trophy date has been set by Filey - January 27th 2013. 12-12-2012 - Members, please take not the Fleece shuts for 6 weeks for refurbishment and building works after Sunday 13th January 2013. 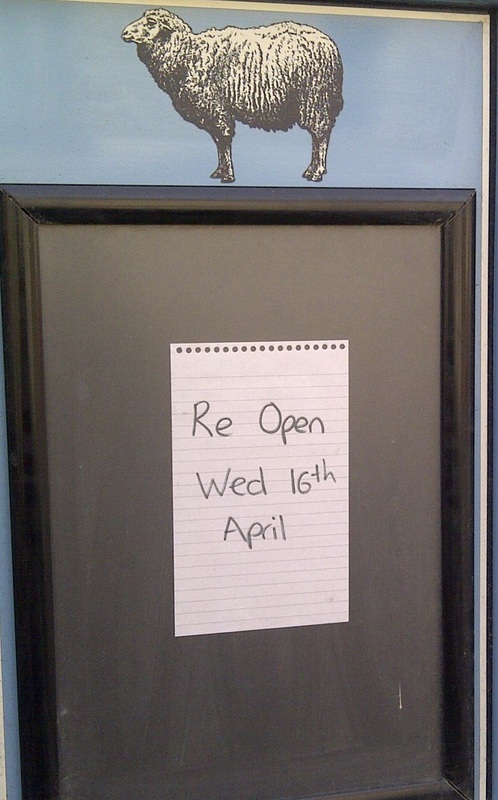 Re-opens approx. 25th February 2013. 02-12-2012 - Well done to WSAA member Andrew Cass, who came 2nd in the Cloughton Open on Sunday 2nd December 2012. 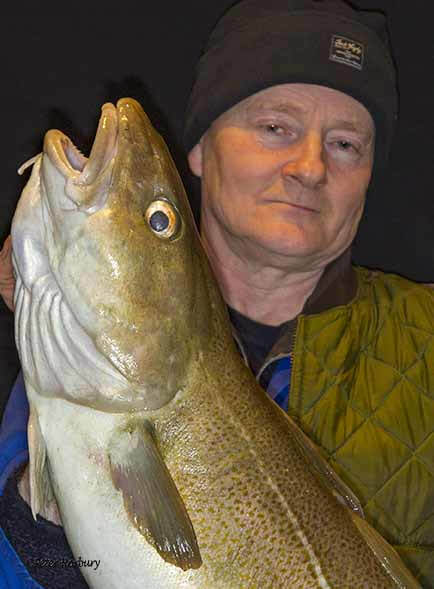 He is pictured here with his cod of 12 lb 04 oz. 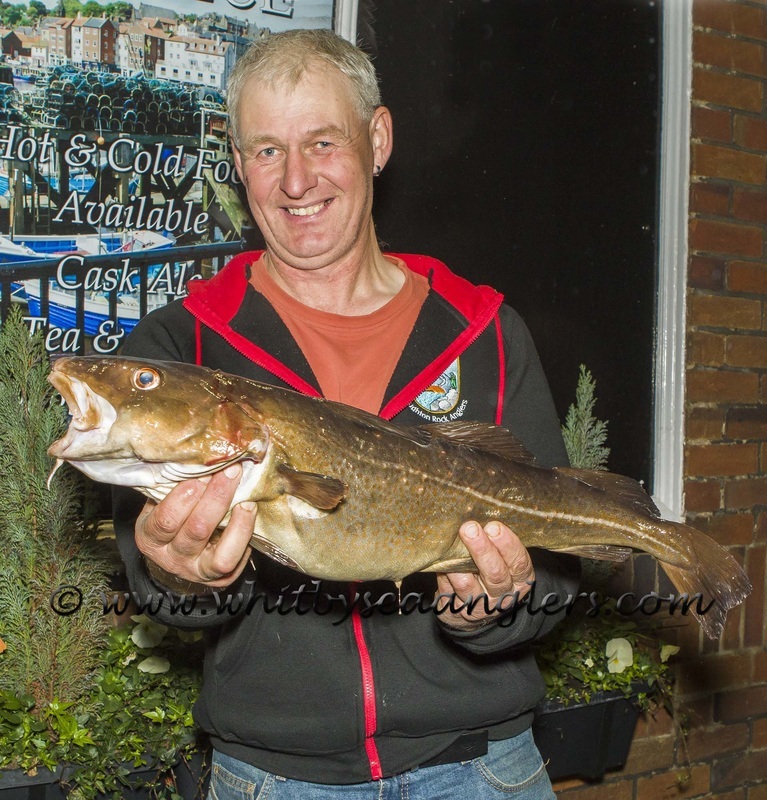 1st place went to Chris Scaife with a fine cod of 16 lb 14 oz. Andrew's fish is now registered as the Heaviest Fish caught out of a club match. 18-12-2012 - Pete Dunn "Neptuned" the opposition in the 33rd Annual WSAA Open Match on Sunday 18th November 2012. 05-12-2012 - We are trying to draw up a results list for the 2010 Open. If you can help and fill in the spaces it would be appreciated. 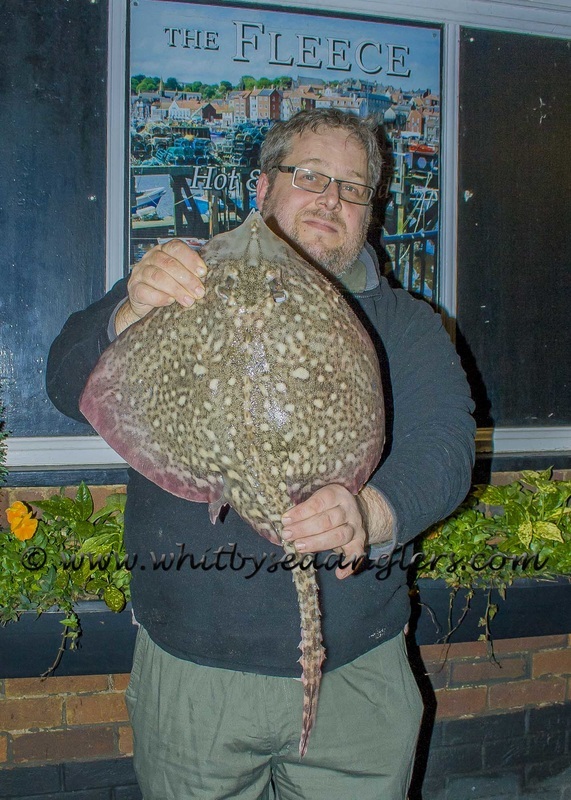 This site is the Official home of 'Whitby Sea Anglers Association'. The friendly home of club fishing but competitive! The Secretary aims to have the web site updated by midday, following a WSAA club match. More archives will be added as time allows, thank you. Please Note, all 'Menu' options have web content (accessed by a click of the mouse). However some 'Menu' options have sub menus which can lead to another sub menu, enjoy. We hope you like our new site and as you can see 'Comments' can be submitted (Menu 2012-2013 Results and Standings), once approved, will be published or you can email WSAA using the Contact Us the form, thank you. Warning, the Comments Box is a trial and if it is abused, the option will be removed or limited to members only. All internet links to 'WSAA Open Sponsors' and 'Links' to useful information, open in a separate window for your convenience. For further information please use the Contact Us form please, thank you. If you are viewing our web site from another club and wish to inform our members of your Open Match, then please contact the secretary, using the Contact Us form, who will quite happily publish your Open date and any details.